I’d been thinking about the above image last week and how it was all meticulously planned out in my head even before arriving at the pool. I probably started thinking about making this image a week ahead of time when I first saw the assignment on the schedule, but it hadn’t been given to a photographer yet. 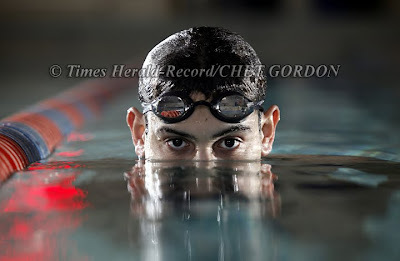 I began “imagining” how I’d want to photograph our local HS swimming sensation, Eric Culver during a morning practice. I’d already photographed him in action a few times at meets (at left, also lit with multiple strobes) and at the Empire State Games a few summers ago as well. The kid was very agreeable to my idea, as were his two coaches. That was a big help, and everyone was enthusiastic. I just had to wait until practice was over, as I wanted to make sure there weren’t going to be any unnecessary waves in the pool. Yes, besides planning everything down to the last detail of utilizing two or three small camera flashes with snoots to light the subject, I was planning on getting in the water with Eric. Having never seen this particular college pool, I gave a silent sigh of relief to myself when there actually was a shallow end at the starting blocks. Couldn’t imagine attempting this image if the pool didn’t have a shallow end for me to stand up in. While the team continued practice for another hour or so, that time allowed me to properly set-up my remote lighting kit with Pocket-Wizard radios & transmitters (I went with three strobes) and shot quite a few test images (above) at various exposures, – well ahead of time before I was going to step into the pool. I kind of figured that I’d want to keep the shooting time for me in the water to only a few minutes, so when I did get out of the water, I’d better have all the images I wanted. While waiting for practice to end, I manged to make a few simple portraits of Eric (at right) when he paused at the starting blocks to talk to one of the coaches. There was this wonderful window light coming in through a bank of large frosted glass windows behind the starting blocks, and when he sat on the blocks between practice starts – it was just a ready made feature portrait there for me to make too. On these quick images, you can actually see where the strobes fired to sort of give a little fill – light on his right arm, shoulder, and face as well. That light is coming from the far strobe that I placed on the lifeguard chair near the far end of the pool. Everything worked and one of the coaches even changed lenses for me at poolside while I was in the water. I remember the camera strap getting wet, and verbally reminding myself not to let the camera go, even if the wet strap was around my neck, as we were both standing in waist deep water. One of the biggest factors in completing a portrait session like this or any other non-typical assignment for me is to obviously be prepared with all your gear & well thought out routine all ready to go – including a backup plan if needed, be confident that you can accomplish the assignment, let the subject and support people know what you’re trying to do to create the type of images you set out to do, and most of all – have fun…!!! ~cg. This entry was posted on Monday, March 1st, 2010 at 12:41 AM. It is filed under Uncategorized and tagged with location lighting, pocket-wizard, pool, portrait, remote, sports, strobe, strobist, swimming. You can follow any responses to this entry through the RSS 2.0 feed.